Amenities: BBQ area and exercise room. Like the most: Residents of the Lodge condos have told me living at The Lodge does not feel like living in a "complex". As one resident described it "city life that feels like your in the suburbs". They also like the cross breezes the architecture allows. Many expressed their love of the location, not too busy yet close to the Balboa Park, harbor and the airport. Some positive comments on the downtown skyline view and the views to Point Loma. Some residents at the Lodge added they like the restaurants that are within walking distance (hint Mr. A's is one of them). Like the least: Walking home late at night, it does not feel too safe. A few residents mentioned too many homeless in the area. (Gee I thought this was a problem in the East Village, not Bankers Hill, I report you decide). Some said they do not like the noise from the airport. 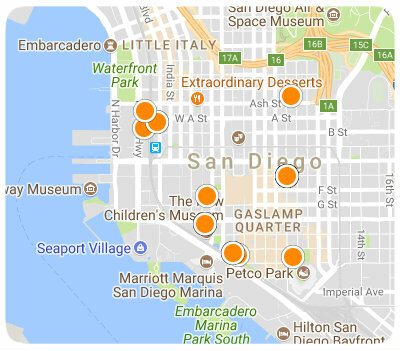 Other comments: Centrally located, mid distance to Little Italy, Balboa Park, Gaslamp and Hillcrest. Some Lodge owners mentioned they are glad the views they have will probably always be there because of the height limitation for new buildings in the flight path (to the airport).